There are ethics, and there are smithics. Kevin Smith sits on the board of SPJ’s foundation, called Sigma Delta Chi. Yesterday, he endorsed a candidate for SPJ office. Rebecca Baker deserves your vote for secretary-treasurer. As past president, board member I know her commitment and visions and I support her leadership of the Society. Not really. Not according to Smith’s boss, SDX chairman Robert Leger. The committee concluded a policy wasn’t needed and offered the following guidance statement: “Sigma Delta Chi Foundation board members are cautioned against actively participating in SPJ election campaigns.” The minutes indicate the board approved the guideline. Those minutes don’t indicate if Smith voted against it, but he’s definitely violating it now. Sure, it’s not an ironclad rule. But it’s at least unethical to brazenly flout this guideline. Thing is, Smith is the previous chairman of SPJ’s Ethics Committee, and he’s a journalism professor. It must be easier to teach ethics than to practice them. Since South Florida endorsed him and your fingerprints are all over that chapter I can’t imagine you weren’t involved in that process…So let’s dispense with the conflicts of interest lecture. You’ve always been good at double standards and bad form. But I guess I’m just not very good at smithics. In SPJ, every vote really counts. You can win a national SPJ office by just a handful of the few hundred ballots cast online, because most of SPJ’s 7,200 members don’t vote. The ones who do must decide by reading vague statements or contacting the candidates themselves. SPJ doesn’t host any debates, online or in person. So as a public service, I posed three crazy questions to four candidates — the only ones in major contested races. Rebecca Baker and Jason Parsley are running for secretary-treasurer, while Bill McCloskey and Alex Veeneman are running for at-large director. Skip to their answers by clicking here and avoid my screed below. I asked the candidates about recent SPJ controversies. Of course, I started these controversies, so I probably care about them more than you do. Still, there’s illumination in their answers that transcend the topics. Incumbents can be more daring than challengers. Baker is a current board member who’s willing to reform SPJ more than Veeneman, who’s running for the first time. In fact, Veeneman’s positions mirror those of incumbent McCloskey, which makes me wonder: Why vote for a new boss if he’ll be the same as the old boss? How you say No is revealing. Baker and Parsley answer with scrutiny and nuance, McCloskey and Veeneman not so much. When you say “no,” it helps to offer counterproposals. New ideas excite voters. No ideas excite no one. I disagree with Bill McCloskey on most major issues facing SPJ, yet he’s one of my favorite fellow board members, and a man I deeply respect. Still, I wish McCloskey (and Veeneman) would show a little more verve in their analysis of SPJ’s condition. Being conservative doesn’t mean being calcified. SPJ is still shedding members at a rate of a couple hundred per year since McCloskey and I first got on the board in 2008. “Stay the course” isn’t working. Rebecca Baker (secretary-treasurer) — I’ve been a vocal supporter of the name change since it was first proposed nearly two years ago. I think renaming SPJ is an important step to show that we are truly an inclusive organization for journalists of all stripes and that we hold “professional journalism” at the core of our mission. Other journalism groups, such as RTDNA, have changed their names to reflect the changing landscape of the business, and I believe we should do the same. As for expanding SPJ from a “trade organization” to an “advocacy group,” I believe SPJ has shown itself to be an advocacy organization in many ways, such as lobbying for a federal shield law and, on a local level, sending letters to state lawmakers opposing open records restrictions and other measures that limit the free flow of information. I think SPJ can be both a trade group for members that offers networking, training, and career advice as well as advocates for the First Amendment and a free press. Jason Parsley (secretary-treasurer) — I believe in the movement behind the name change and I would vote in favor of it. But I don’t believe that will solve the larger problem, which is SPJ’s culture. SPJ can be an advocacy group without changing its name, while changing the name won’t turn us into an advocacy group. The name change itself is not the solution to the problem. It’s more important to elect new leaders that have different perspectives. If we continue to elect the same people again and again we will get the same results over and over again. Bill McCloskey (at-large director) — There is no need to rename SPJ. A poll of the members shows there is little interest in such a change. SPJ is an advocacy group. Stepping up our advocacy and making it more effective has been a goal of the current board and we a slowly moving towards meting that goal. 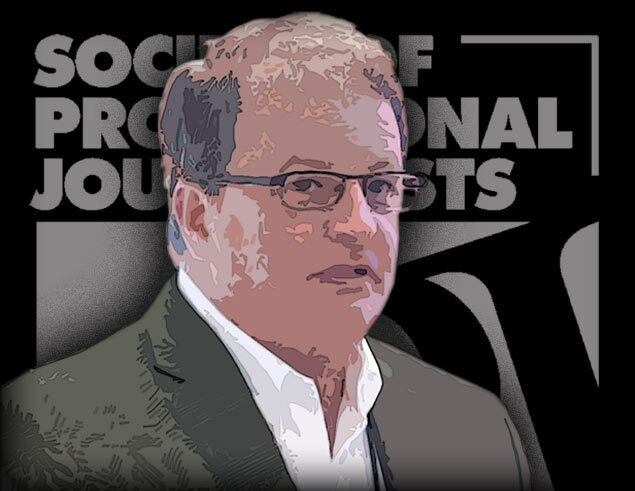 Alex Veeneman (at-large director) — No, SPJ should not be renamed the Society for Professional Journalism. SPJ is already involved in advocacy. Journalism is not a trade. It is a profession (and hopefully a calling). Example. Rebecca Baker (secretary-treasurer) — I believe the delegate system needs to be revised to reflect the 41 percent of SPJ members who do not belong to a particular chapter. I am a member of an SPJ membership task force that is tackling this very issue. The task force has just received the results of a survey of unaffiliated members about what, if any, changes to the delegate system should be taken and soon will be discussing what actions to take in light of those results. In my view, SPJ can either scrap the entire system and allow the member-elected Board of Directors to make all decisions for the organization, or expand the delegate system so unaffiliated members in each region have representation on the convention floor with chapter delegates. Whether either of these options—or a different one entirely—is chosen, I’m sure there will be an extensive discussion about it on a national level. Jason Parsley (secretary-treasurer) — Yes and no. I believe all members should have an opportunity to vote on major decisions like the name change and the code of ethics. But I don’t know if every decision needs a full vote. Engaging the average SPJ member can be difficult. For instance in the last election only about 8 percent of members voted. That is an abysmal number. Having said that it is unacceptable that the voting period is only open from Friday to Sunday. SPJ’s leadership must do more to involve its members, including extending the online voting period. I don’t believe this would even be an issue if SPJ leaders listened more to members’ concerns, suggestions, ideas, desires, needs etc. So the larger issue here is electing leaders that will listen with an open mind and take suggestions, even ones they don’t like, into consideration. Bill McCloskey (at-large director) — No. The delegate system is the only efficient way to have issues thoughtfully considered and arguments made in support and against proposals. Many chapters study the issues before the convention and send their delegates to convention with instructions on how to vote. Alex Veeneman (at-large director) — While I believe it would be a good thing for everyone to be involved and to vote, it is not realistic. Just as in any electoral process, only a minority of members will vote. Rebecca Baker (secretary-treasurer) — To be honest, I don’t have a particularly strong opinion on this issue. I think SPJ board members have the freedom to recommend committee chairs or voice opposition if a chosen committee chair is unqualified or problematic in some way. However, if there was a strong push from the board to take the reigns on this issue, I would not oppose it. Jason Parsley (secretary-treasurer) — The president should have the power to appoint them, but they should be confirmed by the full board. Bill McCloskey (at-large director) — I believe it is a president’s prerogative to select those who will help him or her handle the governance of the Society. The current president decided to ask the board to approve her selections, which it did with no debate. Alex Veeneman (at-large director) — As a sitting director running unopposed for re-election, if this issue concerns you, why haven’t you addressed the entire Board? * Veeneman says he did indeed send an updated reply. I didn’t get it, but I believe him. See his comment below. Who you gonna vote for in next month’s SPJ elections? If you don’t know the candidates personally, it’s hard to tell them apart. In other words, crime is bad and jobs are good. And specifics are rare. As a three-term SPJ board member, I know how hard it is to articulate a clear vision in a single statement. And let’s face it, no one is hosting SPJ debates, because no one would tune in. So welcome to the Real Quick Real Controversial Candidate Q&A. I recently posed five questions to the candidates. I isolated the biggest controversies currently rending our fine organization. Of course, I’m biased: I started all these controversies. So if you don’t give a crap about them, can’t say I blame you. Still, their answers tell you something about how they’ll handle trouble – especially those who didn’t respond at all. At the very end are my conclusions. Patti Gallagher Newberry (Region 4) – I support the name change. Rebecca Baker (Region 1) – Yes. Ellen Eldridge (college student) – I like the idea that SPJ is an organization for defining journalism and not journalists. I joined SPJ to be part of an organization for my industry. I have much to learn still and hope my involvement with SPJ will continue helping me understand and improve in my field as a journalist. Mike Reilley (campus adviser) – We need to revisit this and strongly consider expanding SPJ’s horizons to recruit new members, including young members and retaining campus members as they graduate. 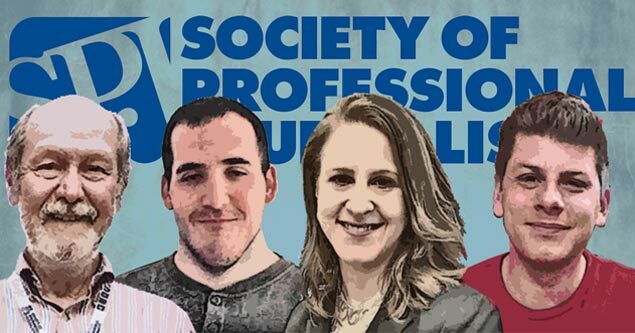 Lynn Walsh (treasurer) – I am in full support of SPJ becoming more of an advocacy group and less of a trade organization as you describe it in this question. That said, I do not know that it needs to change the name of the organization to do so. I think it needs to make a commitment and investment into advocating more for what we as journalists do every day and why it is important for communities around the world. Some of these include First Amendment rights, FOIA and government access and transparency issues and the importance of freedom of the press. In order to do this we need to not just include journalists in our organization, but need to reach out and openly welcome lawyers, activists and other leaders in these areas. Matt Hall (Region 11) – No. I don’t believe rebranding makes sense at this time, and this conversation should be put behind us. The board should focus on actual ways to improve membership, training and journalism instead of debating a name change I humbly suggest is unnecessary despite the arguments you’ve shared and the time you’ve spent on it. Ernest Owens (Region 1) – No, because there needs to be an organization that is helping to protect and inform journalists. There are already enough programs focused on journalism advocacy and yet the professionals themselves can hardly get one. SPJ needs to remain the same in that regard. Paul Fletcher (president-elect) – I personally favor the new name. I don’t know that it is the will of the members or the Board to make the change. There also will be a straw vote on this question on the EIJ14 ballot, and I look forward to hearing what the membership thinks. I think advocacy is an essential part of SPJ’s mission. Jimmy McCollum (campus adviser) – I like the new name, as it is more inclusive of students. Gideon Grudo (at large) – Yes and yes. If SPJ doesn’t adapt to a new universe where the word “journalist” has barely retained any of its classic definitions, it will suffer the consequences of a new universe where an old-fashioned organization barely retains its members (hey!). Tony Hernandez (at large) – Personally, yes. An SPJ task force has polled our membership, and more feel the name should remain instead of changing it. So, I support the consensus that the name should remain the same. Daniel Axelrod (student) – I believe that SPJ’s name should not be changed. This debate is a distraction and a red herring. Changing SPJ’s name to the “Society for Professional Journalism” wouldn’t alter the organization’s mission. The Society’s advocacy efforts are already (and long have been) strong and explicit in SPJ’s support of a shield law and the Society’s constant fight to promote freedom of information and free speech. Now, if SPJ’s members and its leadership want the organization to devote even more time toward those and other advocacy initiatives, the Society can do just that without changing a name that has become a strong, reputable brand over its many decades of use. Jordan Gass-Poore’ (student) – No. The people in the trade are the trade; without journalists there’s no journalism. The emphasis needs to be on educating people on how to uphold the principles of professional journalism and how to advocate on its behalf, regardless of medium and title. Patti Gallagher Newberry (Region 4) – All members. Rebecca Baker (Region 1) – 7,500 members. Ellen Eldridge (college student) – I think all 7,500 members should be allowed to vote, but I believe many will not make use of their right to vote. Mike Reilley (campus adviser) – Yes. One member, one vote. Lynn Walsh (treasurer) – I am OK with just the delegates voting on the updated Code of Ethics. But, that does not mean I would be opposed to having all of the members vote on it. I have been involved with the process of updating the Code and feel as if some of the transparency issue your brought up in the beginning have been addressed. For me, SPJ’s Code of Ethics started out as a broad look at how journalists should act professionally and I think it should stay this way. My only hesitation is that by allowing everyone to vote, nothing will ever be updated and that to me, is the worse-case scenario because it needs to be updated and has needed to be updated for awhile now. Why do I think it will not be updated or pass if everyone votes on it versus just the delegates? I think there is a great possibility people will get caught up on one phrase or one word and vote against it for that reason. And that is not what the code is for, in my opinion. The code, to me is meant to be a guide, and we as individual journalists have to decide what we will agree with or not — we create our own individual codes and I hope look to others for advice with this. Matt Hall (Region 11) – The process is what the update process is, and if the board wants to discuss changing the process, that conversation should be held — and be resolved. But I will say this: Delegates of any group are elected to represent membership, study alternatives and make decisions that could drag on if a much greater number of people were voting on anything. We are where we are in the process, and I can’t imagine this will be a simple up or down vote in September; it’s more complex — and potentially more acrimonious, to use someone else’s word — than that, as it should be. Additionally, all chapters know this issue is coming up in September and should be discussing their positions on it with every representative they are sending to Nashville. Beyond that, each chapter has also had multiple chances to weigh in during the review. The San Diego Pro Chapter, for one, posted the code on our Facebook page on March 27 and again on July 7, seeking input and trying to foster debate. Ernest Owens (Region 1) – SPJ’S 7500 members should because the Code of Ethics affects us all and if we are to elect members, we should also elect new revisions collectively as well. Paul Fletcher (president-elect) – As you know, I favor adopting one member, one vote for SPJ decision-making, and I will be working on that in the coming year if elected. But OMOV requires a bylaws change. Even if it is adopted by the delegates at EIJ15, it wouldn’t be in effect until EIJ16. I don’t think we want to wait that long for a revision to the Code of Ethics. We have system in place for EIJ14 that provides for input from both groups. There will be a straw vote on the revised Code of Ethics draft on the ballot sent to all members. The delegates will have the benefit of that input before the discussion and vote on the Code in the final business session of the convention. Jimmy McCollum (campus adviser) – 150 delegates. Gideon Grudo (at large) – We’re an OMOV group now, so I favor the latter. If it’s too late to practically bring this into effect for this round of the revision, a new round should open up for EIJ15 (or EIJ16 if the red tape is real nice and thick) and solidly involve every single member of SPJ. Tony Hernandez (at large) – I think the more eyes on the new Code of Ethics the better. In a perfect world, all 7,500 members should review and cast a vote on the Code of Ethics, however given that online voting is just a few years old, a small percentage of our 7,500 members have actually voted. I think our leaders need to encourage more of our membership to vote before we start solely relying on One Man One Vote for crucial decisions. I think our delegate system has been established to carefully vet chapter representatives to consider important SPJ issues, like the new Code of Ethics. The short answer to your question: let both bodies vote. Daniel Axelrod (student) – If there is a hue and cry from the regular members, and a great many of them want to vote on a new ethics code, then the Society should consider changing its voting process. But, for now, why fix a system that doesn’t seem to be broken? The delegates closely follow SPJ’s news, deal with the Society’s dilemmas, and thoughtfully consider SPJ’s initiatives. The delegates are among the most dedicated and passionate media professionals, journalism teachers, and communication students in the country. And they represent — and act in the best interests of — the rest of the Society’s 7,500 members. Jordan Gass-Poore’ (student) – Yes. All of the SPJ Code of Ethics revisions should be made available to its membership in a timely fashion with the dates those revisions were made and the names of those who helped make the revisions. The revision should reflect the current state of journalism, and the only way for that to happen is to have input from as many journalists, members, as possible – crowdsourcing is the most efficient and transparent way to do this. Patti Gallagher Newberry (Region 4) – Abstain. Rebecca Baker (Region 1) – Staying out of this. Ellen Eldridge (college student) – I don’t know, but I don’t see anything I know to be factually inaccurate. I can see where your blogs would rattle Cuillier, but as far as I understand libel nothing on the blog was libelous. I appreciate that you are unafraid to stand up for your beliefs, and I appreciate the chance to read your perspective. I’m trying to stay informed, but I’m new to SPJ and have much to read and learn. Mike Reilley (campus adviser) – I haven’t read the blog so I don’t have an answer on this one. Lynn Walsh (treasurer) –I do not think you were libelous while discussing SPJ Code of Ethics on your blog, BUT I also do not think that the process has been unethical. As someone who has spent long hours to help make the process more transparent, all of which as you know is voluntary, I think the process has changed and become more transparent. Could it be better? Yes, I think everything we do, you will find there is a way for it to be better. But, I also have noticed when you or others have raised complaints or issues about something, I see and saw changes. I think sometimes what we all have to keep in mind is that all of the people involved in this process and other changes and issues in SPJ are volunteers, as you are. I truly believe everyone tries their best and is doing everything they can. I think it is OK to criticize and I love seeing processes and things improve, but the approach of how this happens is important, in my opinion. I always welcome criticism and suggestions for improvement and hope that sort of thing continues, and continues respectfully. Matt Hall (Region 11) – I’m not sure what was said in the discussions between you and David because I wasn’t there. I respect both your rights to speak your mind and appreciate both your efforts to make the board more transparent. I see that you and David worked together to foster positive changes in the industry before this disagreement. All part of the back and forth on a board, I guess. Ernest Owens (Region 1) – No, you are entitled to your own opinion and you openly had legitimate concerns that supported your argument. You statements had merit based on your visible findings and personally the term “libel” was inappropriately used in this case. Paul Fletcher (president-elect) – You are asking for a legal conclusion in this question, so I decline to answer. Jimmy McCollum (campus adviser) – No. Gideon Grudo (at large) – You mean, “when I criticized the Code of Ethics revision process.” And: No and no. Tony Hernandez (at large) – Not touching this one with a 10-foot pole. Daniel Axelrod (student) – I take no stance on this question. If elected to the SPJ board of directors, this is exactly the sort of non-issue that I will strenuously avoid. The American journalism industry has been through the most tumultuous 10-year period in its history. Newspapers alone lost one in three of their newsroom employees between 2000 and 2010, according to an estimate by Rick Edmonds, Poynter’s media economist. Meanwhile, SPJ’s membership has dwindled from well in excess of 8,000 to 7,500. These are the challenges, and the backdrop for action, that the Society as it continues to both support journalism and journalists for years to come. Patti Gallagher Newberry (Region 4) – Yes. Rebecca Baker (Region 1) – I think the 2 at large directors have done and would continue to do a good job choosing the chapters but I wouldn’t oppose a change. Ellen Eldridge (college student) – I believe the more people who can weigh in on an important vote the better so, yes. I’m a bit surprised to learn only two directors decide. I would have assumed the entire board voted. Mike Reilley (campus adviser) – Yes, the entire board should vote on these. It’s an important honor and it needs broader input. We also need more clearly defined criteria for the chapter awards, particularly for the campus ones. And I say that as adviser to a student chapter that has won National Outstanding Campus Chapter of the Year twice. Lynn Walsh (treasurer) – I would support this completely and think it is a great idea. It allows more people who may have less of a bias to make a decision on who should be awarded. Matt Hall (Region 11) – I don’t know enough about this issue. I can see why you might want more than two people choosing victors among the various regions, but there is likely a legitimate reason it was set up this way: Maybe keeping the regional directors on the sidelines at that stage avoids conflicts of interest. Perhaps this is something to discuss among the board. Ernest Owens (Region 1) – Yes, the entire board should because the importance of the honor should have a more diverse and larger input in the decision. Paul Fletcher (president-elect) – You presented a well-reasoned request that we try a board-wide vote for chapters of the year for 2014. We are proceeding with that experiment. I think that was and is a good idea. Jimmy McCollum (campus adviser) – Yes. Gideon Grudo (at large) – I’m running to be one of these at-large directors. So on one hand I should recuse myself from this answer, but on the other hand: Yeah, two people voting on something like this is messed up, to say the least. Two people can handle the tasking task of coming up with finalists. The board can vote on the winners. Tony Hernandez (at large) – The more eyes the better, but I don’t think the board should have to review all 12 recommendations submitted by Regional Directors for pro and student chapters, or 48 chapters in total. I think the two, at-large directors should continue to vet the RD recommendations and provide the top 3, 5, 8 or whatever recommendations for the board. If that were also the case, I think the RDs who have chapters nominated abstain from voting. Daniel Axelrod (student) – This question represents yet another non-issue. If the present system of picking “Chapter of the Year” nominees has worked relatively well (and without many complaints), then it should be left alone. There are far more important issues for the Society to focus on. News organizations are still eviscerating their staffs. Newly minted reporters can’t get jobs. And when media companies aren’t being sold for pennies on the dollar, they’re going bankrupt. Veteran reporters need more training to adapt and thrive in the new media ecosystem. And, in the struggle between the market and the mission, all journalists also need support against corporate owners, who increasingly make questionable decisions that place profits above public service. Young reporters need more opportunities to get their feet in the door of news organizations. And news consumers need media companies to stanch the flow of reporters because the watchdogs are disappearing and democracy is threatened. Jordan Gass-Poore’ (student) – Yes. I also support allowing all SPJ members to vote for a new set of rules prior to a revision of the organization’s code of ethics. Once a new set of rules are in place then all members should have the opportunity to vote for a new code of ethics. All interim board positions and award changes should also be voted on by the organization’s membership. Rebecca Baker (Region 1) – I don’t object to the presidential appointments but I wouldn’t oppose a change. Ellen Eldridge (college student) – Yes, as long as the board members have a chance to make informed decisions and aren’t just playing eenie meanie miney mo. Mike Reilley (campus adviser) – Yes, the board should vote on the committee chairs. There was an issue with this a few years ago with the Digital Media Committee. A board vote would help deter such issues. Lynn Walsh (treasurer) – I would also support this. As with the suggestion in your previous question, it opens the decision up to more people who may not be as close to the person being appointed, making the decision less bias in the end. Matt Hall (Region 11) – Not at this point. Many organizations allow presidents to appoint committee chairs, and it doesn’t seem unreasonable. I’d be happy to listen to arguments on either side if there is a debate on this, but it seems to me that the bylaws give the president that authority, and members get a chance to elect a president they believe will follow the spirit and letter of those bylaws to the best of his or her abilities. Ernest Owens (Region 1) – The board should appoint these members because they will all have to work with these individuals, not just the president, and that is important. Plus, American history has taught us about the ills of the ‘spoils’ system and how former president Andrew Jackson used to abuse his presidential privilege when appointed his friends to cabinet. This should not be happening at SPJ! Paul Fletcher (president-elect) – Ever since Andy Schotz asked me this question early last month, I have said I have no problem with some form of confirmation process for board chairs. While there is no requirement (and imposing one would mean a bylaws amendment), incoming President Dana Neuts will be submitting her chair choices voluntarily to the board in September for their consideration. Gideon Grudo (at large) – Yes, but this is low on my totem pole, and its implementation could get kinda dicey. I just hope that committee members don’t quit if a chair ain’t pulling his or her weight, but instead take action to remedy the issue. “I’m in agreement with you about having the board ratify a president’s selection of chairs and vice chairs. However I would hope you (and future presidents) provide enough information to justify the selection of the chairs/vice chairs. I don’t need a life’s story or full professional breakdown. Maybe SPJ can create a boilerplate form/application for all chair/vice chair candidates to fill out and send to the board. Daniel Axelrod (student) – Once again, this question misses the mark by a mile. Any board member who views this as an “issue,” let alone a pressing concern, is lost in the minutiae of trivial procedural matters. What can SPJ do to best serve journalists, and the journalism industry, in the digital age? That’s the operative question. 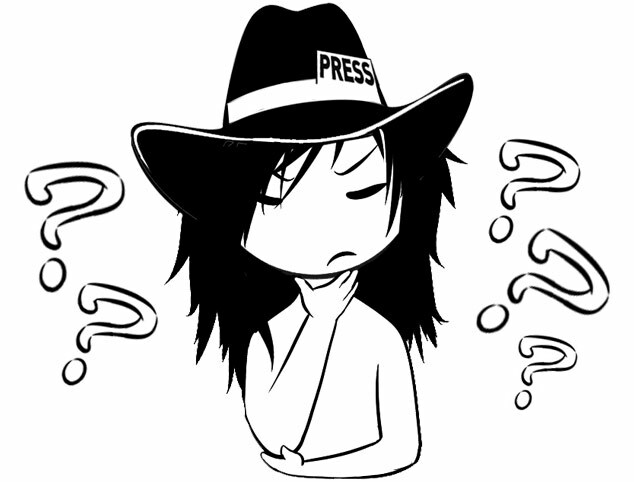 If SPJ doesn’t focus on that question, there will be no chapters, committees and bylaws (or very weak ones). In the meantime, I see nothing wrong with SPJ’s president nominating the leaders of the organization’s committees. If the President of the United States can pick his cabinet secretaries, why can’t SPJ’s president appoint good, competent folks to serve the organization? Jordan Gass-Poore’ (student) – Yes. I believe this helps provide more people with more opportunities to have a voice in SPJ. • I don’t care if these candidates agree with me. (I don’t always agree with myself.) I only care if they took a stand or weaseled out of one. I know I’m not always right, and the best way for a loudmouth like me to realize I’m wrong is to engage in rigorous, dispassionate debate – you know, sorta like how journalists are supposed to do their jobs. Then, win or lose, we should go drink and laugh. Also like journalists are supposed to do. • Journalists make lousy politicians. When we cover elections, we try like hell to force candidates to reveal what they really think. Yet when journalists run for SPJ office, they try like hell to be vapid and vague. I appreciate the candidates above who gave short, sharp answers. • Controversy is good for SPJ. Want to boost both SPJ’s membership and its competitive races for the board? Embrace the hot topics and hard choices. We’re journalists, not podiatrists.